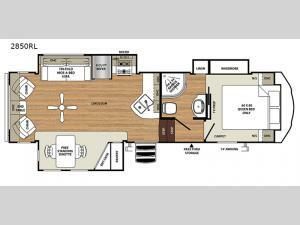 Step inside this Forest River Sandpiper HT 2850RL fifth wheel and experience camping like never before! Inside the front private bedroom, you will enjoy a good night's rest on the queen bed with nightstands and overhead cabinets on either side, a large wardrobe for you to keep your clothes tidy, and an area prepped for a TV, plus an entrance into the dual entry bath. Throughout the unit there is plenty of overhead cabinets for you to keep all of your camping items in order. The rear living area consists of a tri-fold hide-a-bed sofa, and two swivel chairs with a table in between, plus a ceiling fan to cool you off on those hot summer days!